Wild Alaskan salmon is often said to be the best choice when it comes to salmon because it is a good source of health-protective omega-3 fatty acids and sustainability. Ocean farm-raised salmon is to be avoided due to concerns about potential contaminants and environmental impact. With the more recent development of "sustainable" tanked/inland based salmon farming, this becomes a more complex issue. When you hear the term “sustainable seafood,” you might envision a fisherman pulling catch from a pristine sea. But in 2014, the Monterey Bay Aquarium’s Seafood Watch, arguably the world’s most influential arbiter of seafood sustainability, gave its highest stamp of approval to three companies that are about as far away from that fishing ideal as possible. The Atlantic salmon deemed “Best Choice” by Seafood Watch are neither caught, nor from the sea. They spent their lives indoors in warehouses as far inland as Shepherdstown, West Virginia. In the past, Seafood Watch has almost always advised consumers to avoid farmed salmon. 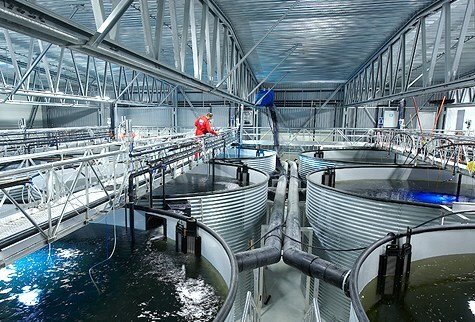 But three indoor farms around the world have succeeded in eliminating the usual concerns about fish farming. At these farms, there’s no risk of escapees mating with wild populations. There’s no risk of fish waste messing up the marine environment. There’s a vastly reduced risk of disease. Each of these farms recycles more than 95% of its water, and they use a smaller number of feed fish to grow their salmon than traditional farms. There are other reasons to love these warehouse or “tank” farms. One of the farms, called Langsand Laks and located in Denmark, uses wind and geothermal energy for its electrical needs. The West Virginia farm, run by the Freshwater Institute, is using nutrient-laden fish waste to develop an aquaponic farm. And the British Columbia farm called KUTERRA, is touted as a an important job creator for Vancouver Island’s ‘Namgis tribe. Seafood Watch’s stamp of approval may be the biggest yet for indoor, land-based aquaculture, but it’s not the first. During the past few years, a growing number of supporters—from environmental groups, often hostile to aquaculture, to sustainability-minded chefs to marine biologists—have been talking up the virtues of indoor aquaculture. Critics say the indoor farms are little more than lab experiments until they prove their economic viability, and they point to several flops—most famously, the New York fish farm Local Ocean. They graced the cover of TIME in 2011 under the headline “The Future of Fish,” and boasted of “zero discharge”, yet closed abruptly spending its entire four-year existence in the red, according to Seafood Source. There are certainly good reasons for farming salmon in the ocean rather than in tanks on land. Indoor fish farmers have to take care of many things that nature easily provides: water temperature, oxygen content, pH levels, not to mention a physical environment. Even the most evangelical indoor fish farmers concede that their way is more technologically challenging and more costly than ocean farming. A 2013 study by the Freshwater Institute and Norwegian research organization SINTEF found that an indoor salmon farm was more than three times as expensive to operate as a traditional ocean pen salmon farm. Still, despite higher costs, business failures, and an industry typically negative on newfangled ideas, no one should count out indoor fish farming. There have been numerous new projects announced during the last few years - from salmon farming in China’s Gobi desert to a plan to build the world’s largest indoor salmon farm in Scotland - which also happens to be one of world’s major ocean salmon farms. There are now nine land-based fish farms working that produce more than 7,000 metric tons of salmon annually. There are also dozens of smaller-scale projects cropping up, like one in a Hong Kong high-rise and one on a Wisconsin dairy farm. There are some compelling arguments for indoor fish farming. Fish grow faster indoors, proponents say, and fewer die. There is less need, if any, for vaccinations and antibiotics, and feed costs are less than ocean farmed fish. There are also collateral benefits, such as using fish waste compost to grow vegetables or generate electricity. The two big indoor fish farms that have thrived for 10-plus years, Martin’s Blue Ridge and barramundi-farming Australis, aren’t selling their haul to your Safeway. They’re selling to the “live market”—consumers who want higher quality, fresher, live fish and will pay for it. Likewise, Seafood Watch-approved salmon farms are targeting sustainability-minded foodies who are happy to pay more for a fish that is clean and green. There’s also another argument you’ll increasingly hear from the “go indoor” crowd. It’s the patriotic thing to do... Nearly 90% of American seafood is imported. One can argue that environmentally concerned consumers should seek out sustainable American sources of wild caught seafood. Land-based, closed-containment farms, such as the Massachusetts-based Australis has the potential to provide Americans with a source of sustainable and locally sourced seafood. The idea of Atlantic salmon harvested in a West Virginia warehouse might not strike one as appealing as salmon that hails from a Norwegian fjord. But if Alaskan wild salmon isn’t readily available where you live and when you start considering the state of world fisheries, the soaring seafood consumption, the ridiculousness of the global seafood chain (fish caught in Alaska, processed in China, sold in Miami), well, then that antibiotic-free, zero-discharge West Virginia warehouse-raised salmon starts to appear pretty appealing. Also keep in mind that you can get the same omega-3 fatty acids found in wild Alaskan salmon from canned sockeye (red) salmon sold in supermarkets - it's all wild - sockeye cannot be farmed.